@Jimmy06 it varied from 1mb to 3.5mb. It's not designed for fibre customers as @jackdinn will probably vouch. 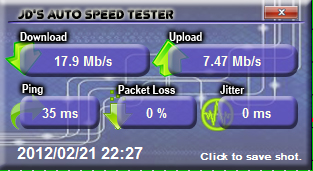 (20-02-2012 08:47 PM)SpencerUk Wrote: @Jimmy06 it varied from 1mb to 3.5mb. It's not designed for fibre customers as @jackdinn will probably vouch. I can upload Notably over lan at 96.45MB/s Hense why im asking. This however was only after trying new methods for the upload and been inplace since the Multi threaded download tests. Just trying to see if theres any way we can improve the data for you guys. It was mentioned that maybe doing a multi-threaded upload test might be a way to max out your fiber connections. Firstly im wondering if your testing with the adapter hooks turned off as there is a known problem with the max throughput for upload with this method of testing, if the "load hooks" tickbox is un-ticked the max upload speed is approx 2Mb/s which was why i created the separate child process to handle the upload stream whilst monitoring the "numbers" with the main process by use of the adapter hooks. Secondly i was not 100% sure if you meant multiple threads to the same server but i assume you did. Iv been looking at this suggestion and have been able to do a test of multiple ftp uploads to the same server. I have created a quick change to the app and set 3 upload threads but i will add a user option to choose how many threads the user wants (within reason) if this actually makes any difference. If anyone would like to help out by checking if this is going to make any difference then please download and let me know how it goes. It would be nice to see a before and after test really. This has no adverse effect to an ADSL+ connection and the results are the same. I feared this method might saturate the upload stream but it copes with it fine. 0.751 Mbps upload threw my ADSL+ connection as per usual. 2. whats the difference now ? 3. what was it before ? 5. you say the upload test is much better but does that mean it is correct for you now or just closer ? cool, , i assume it really did Finnish to fast. we can of course increase the test files size ^^ but might be a good sign. Maybe this idea might just work, not quite sure as yet but fingers crossed ! (22-02-2012 09:16 AM)jackdinn Wrote: cool, , i assume it really did Finnish to fast. we can of course increase the test files size ^^ but might be a good sign. With a 2Gb test file both down and up. The main drive in this system is slow and old i belive its a hardware limitation here as when loaded into VRAM its extremly fast.